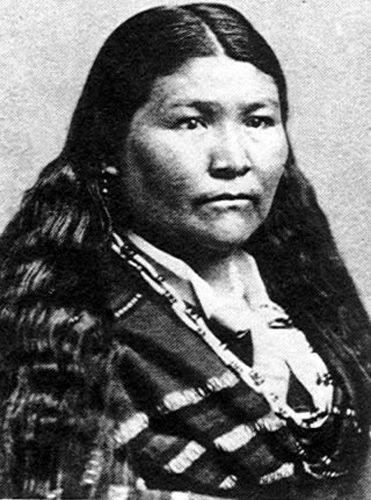 Kaitchkona Winema, aka: Toby Riddle (1848-1932) – A Modoc woman better known simply as Winema, she was born sometime around 1846. Starting life in southern Oregon, she was said to be cousins with famed war chief Kintpuash, although some sources say he was her brother. Her birth name was Kaitchkona, but later she would also be called Nonooktowa, loosely translated as “strange child”, because of her exploits in things more boyish, like hunting and fighting. She would later earn the name Winema, meaning “woman chief”, after, at the age of 14, she guided a canoe full of children safely through the rapids of Link River, saving their lives. It was also reported that around the same age, she led a defensive victory for Modoc warriors during a surprise attack by a band of Achomawi. In her late teens she met, and fell in love with, Frank Riddle, a white miner from Kentucky who came to the West Coast in 1850 looking for gold. She defied the Modoc traditions and her father by marrying Riddle. That’s when she took on the name Toby. After the tribe and her family shunned her, Frank Riddle smoothed things over by fulfilling the obligations of a Modoc groom, and was eventually welcomed into the family. Frank and Toby would settle in the Lost River area of California. Winema (Toby), gained knowledge of the English language, and with her understanding of the white man’s world, she became a great interpreter and mediator. Meanwhile, in 1869, when the U.S. Government re-organized “Indian Policy”, removing military supervision on the reservations in favor of church leadership, Methodist minister Alfred Meacham became Superintendent of Indian Affairs in Oregon, and for several years worked with Toby and several tribal leaders in an effort to resolve the tribes problems on the reservation. When the Modoc left the Klamath Reservation in 1872 to return to Lost River, Frank and Toby Riddle served as interpreter to the various commissions that worked with them. Captain Jack was hanged for killing General Canby during peace negotiations. After the Modoc, led by Kintpuash, fled to the lava-beds east of Mount Shasta, and had defeated a detachment of soldiers, the Government decided to send a commission of men to arrange a peace agreement. 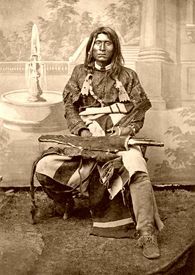 Winema warned Commissioner Meacham of the murderous temper of Modoc warrior Kintpuash, also known as Captain Jack, and some of his followers. Convinced, Meacham warned his fellow commissioners, General Edward Canby and Reverend E. Thomas that their lives were in danger, but could not swerve them from their purpose. During the meeting, when General Canby refused to withdraw the troops from the lava beds, the Modoc Chief gave the signal and Canby and Thomas were killed. When Modoc shaman, John Shonchin then turned his rifle upon Meacham, Winema, who was present as interpreter, pleaded for his life, placing herself between the assassins and the victim. However, Meachham was shot anyway, but she saved him from being scalped when she cried out that the soldiers were coming, where upon the assassins fled. Though severely wounded, Meachham survived, thanks to Winema. When the soldiers finally came, she advanced alone to meet them. Afterwards, a crippled Meacham took Winema, her husband, Frank, and her son, Jeff, to the east to continue his intercession on behalf of the Indians, especially the Modoc, even though they had almost killed him. In 1874, Meacham developed a lecture-play entitled, “Winema,” that told eastern listeners of the Modoc War and the reasons which led to the uprising. The troupe, which included Winema, Frank, and their son Jeff, as well as several other Modoc Indians, toured until 1881. When the tour was over, Winema returned to Oregon where she lived quietly until her death on the reservation on May 30, 1932. She was buried in the Modoc Cemetery. The Winema National Forest is named for her.